Tefilah: End Of Unit Project! This week we wrapped up our unit on Tefilah (prayerful conversation). This unit culminated in a final project where kids made panels that represent each of the tefilot we do. Continue on to get a glimpse into our process! Ask God questions, because we want things we can’t get at Target. Believe that things will be ok. Understand things our parents don’t know and aren’t in the dictionary. Ask questions (and get answers). A circle for Adon Olam, because olam means the world and infinity, and a circle doesn’t have a beginning or an end. People bowing and praying together for Barchu. Crossing the sea for Mi Chamocha (Exodus 15:11). A tree for Tzadik Katamar (Psalm 92). A bride for Lecha Dodi. 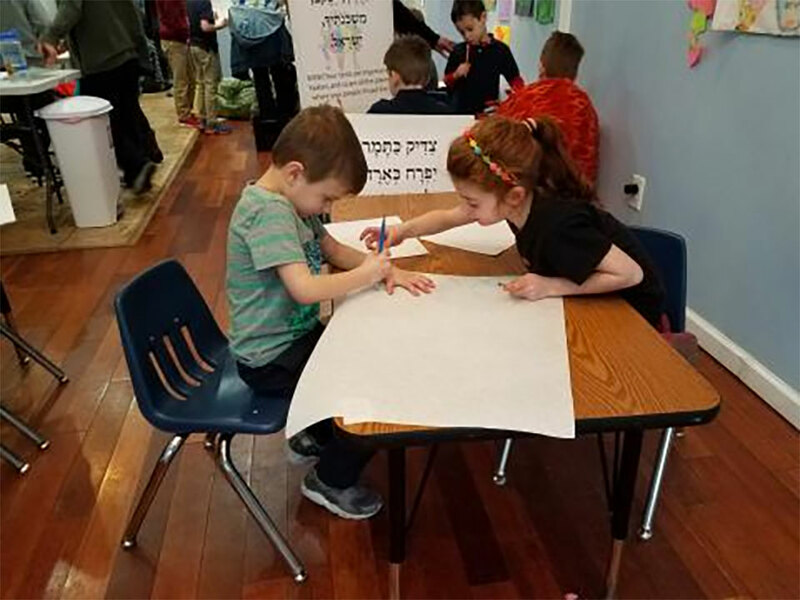 Kids created first drafts on smaller paper that included their symbols, and the name of the tefilah in ivrit(hebrew). Then we simplified our ideas, and made them again on larger pieces of paper. We went over them in dark markers and then traced them onto our cloth panels. After that kiddos selected fabric to color their symbols, and they added those frabric pieces to their creations! These panels will serve as inspiration as we go through our tefilot. We hope that these fabulous creations will help us feel more connected to the big ideas behind each tefilah. Stay tuned next week to hear about our new unit, Haggadah!